Was it really only a few short weeks ago that a handful of British Labour Party MP’s were persuaded, for the sake of debate, to back Jeremy Corbyn as an outside candidate in the party leadership election? It feels like an age. Back then you could have put money on him at 500/1. I didn’t. I do hope some people did. Three months and exactly one hundred packed-out meetings later Jeremy Corbyn is announced as the new leader of the UK Labour Party. “… an effective vocal opposition to these far-right policies that are strangling our economy and destroying the future of our children. We need this opposition where it is most effective – in parliament. We don’t have it, we haven’t had it for years, and we won’t have it for years to come unless we do something, now. As the press – including, sadly, the progressive titles, did precisely this, the Labour Party dragged out its grandees to warn the faithful of the errors of shifting the party to the ‘extreme left’. It didn’t work. We didn’t believe them, and we didn’t believe the press, either. Stunned, they looked on, and in, as Corbyn rallies filled to overflowing. People began to join (in my case re-join) the party in order to vote for him. A momentum had been achieved that would prove to be unstoppable. Jeremy Corbyn – as predicted by me – was now bigger than Jason Donavon. Many on the far right – unable to be seen to be affecting the election – sniggered on the sidelines and joked that they would join the Labour Party to vote for Corbyn thereby making Labour unelectable for decades. A few of them no doubt managed to do exactly that. It’s uncertain as to what effect, if any, they had on the outcome. One thing is certain, however: they’re not laughing now. Aware of the groundswell that is Corbynism, all of a sudden they are deadly serious. Their response came within minutes of the party election results. It is a response that encompasses what they now perceive as an existential threat to their hold on power. They are about to unleash a powerful weapon. A weapon that is easy to see – but difficult to defend against. At its base is the mystical number 3. Any budding comedian learns fairly early on that – unless it’s the quantity of tickets sold – ‘three’ really is a magic number: In the structure of a joke, one punchline, or ‘tag,’ can be funny; two tags often less so; three tags most times funnier than both. This ‘rule of three’ works in comedic set structure, too, and it’s the reason plays, stories and movies are built around three acts. Well, at least the ones that work are. It’s also the reason speech writers and spin doctors will sit for hours trying to find a sufficiently powerful third noun or adjective for whatever tub-thumper they are writing for. It is never sufficient for a king or pope to have mere humility, he must have humility, integrity, and honesty. Of course he may well turn out to be arrogant, deceitful, and dishonest, They usually do, but hey, in both cases the rule of three will give the description more efficacy, and make it more memorable to the listener. More believable. It is why the rule of three is often referred to as the ‘power’ of three. Of course punters, listeners, viewers and readers are mostly oblivious to the power of three. They are often astounded when it is pointed out to them just how much of our lives beat to its mystical rhythm. Start them off with ‘I Came, I Saw, I Conquered’, and expect a deluge of ‘Blood, Sweat and Tears’, ‘Friends, Romans, Countrymen’ ‘Work, Rest and Play’. Mention a movie title, ‘The Good the Bad, and the Ugly’, or a children’s book: ‘The Three Billy Goats Gruff’, and expect the same. It can be fun as a parlor game. Participants happily unaware of the dynamite emanating from their lips. Politicians, however, use the power of three to great effect and when mixed with the constant repetition of a specific word it becomes a powerful weapon of persuasion – regardless of its truth content. Who can forget the wonderfully successful ‘Education, Education, Education’ – its positive spin unfailing in its effect on me even as the recipients of said policy can now barely spell the very word. In the immediate moments following the Labour Party leadership election, before the Kendall love-spittle had barely dried upon the beard of The Chosen One, it became obvious that the Tory government had been hard at work developing a response to what they perceived as the imminent landslide victory of Marxist-Leninism. The blunderbuss approach would be left to the press – this reaction needed to be sharp, focused, and yet cover a large amount of ground without loitering on specific policy details that could encourage dangerous debate. “This man is a threat to national security. This man is a threat to the economy. This man is a threat to your family”. This is their response laid bare. This is their strategy to combat the danger of a viable and vocal opposition in parliament. These three simple phrases will be repeated ad infinitum over the next days, weeks and months in order to indelibly paint the image of Corbyn as the new ‘enemy within’. It is a powerful weapon that we will hear ricocheting across bars, pubs, workplaces and living rooms throughout the country. Fortunately it also shows us where they need to be attacked: Our borders have never been so insecure. Our economy struggles to grow under austerity whilst the few make millions at the expense of the many. ‘Prosperity through Poverty’ they shout. Our families – the old, the young, the disabled, the homeless, the ill, the employed and the unemployed, the teachers and the taught, the unionised and the thousands on zero-hours contracts – are all affected by this governments disgraceful and inhumane policies. It is they that are a threat to our nations security. They that are a threat to our economy. They that are a threat to our families. It is they that are the extremists. It is they that are a threat to us all. Gonna’ be an interesting week. 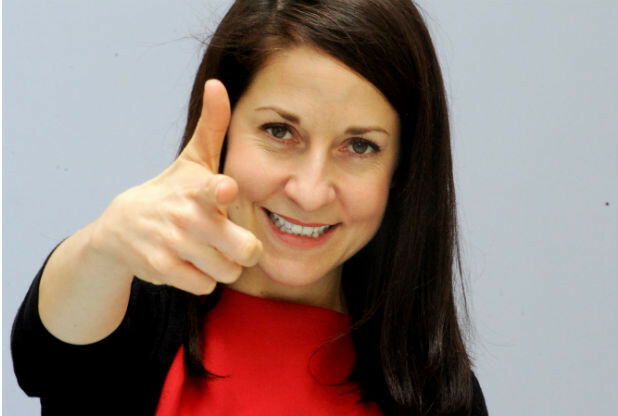 ps: Big hugs to Liz Kendall – who I have been slagging mercilessly – for her obvious joy and excitement at Jeremy’s victory. Good onya, Liz. The other two looked like they had faces like the proverbial slapped arses. 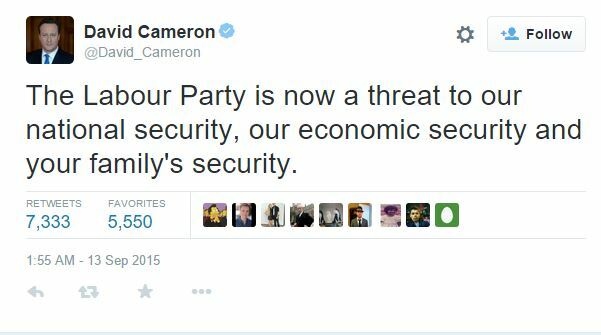 That’s ‘National Security’ out of the way… expect the other two to be along shortly.